The Georgian Bay is one of the premiere cruising areas of the Great Lakes. On February 5 past GLCC Commodore J.E. Fordyce lead an exploration of this pristine region. Although Georgian Bay is within easy driving distance of Canada’s largest city and welcomes many cottagers and other land-based visitors each summer, it is still easy to find pristine and lightly used anchorages all along the east coast of the bay. 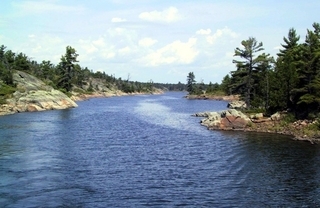 These, combined with attractive towns, such as Parry Sound, Midland and Penetanguishene and smaller communities like Britt and Honey Harbour, make Georgian Bay a paradise for boaters. Be sure to catch the recording of Cruising Georgian Bay's 30,000 Islands. Click here for more information.